Discussion in 'GPS 101 - Which GPS For Me' started by ygal, May 1, 2017. As many other rider I'm looking for a good GPS unit that I can use during my ride but doesn't have to "robe" a bank for buying it. So while the price of the Garmin Zumo 595 went down (at least for the moment) to ~$699, It is still expensive option so what left is to continue use my Android phone. But as I don't like my phone to be "stuck" on a cradle and of course also suffering from not being able to see the screen during the sun light, I was wondering why there isn't a simple Android unit that I can install one of the many navigation apps and use it instead. MT5001 Newest 5 inch Android Motorcycle GPS Navigation MOTO GPS Navigator Waterproof IPX7 with WiFi, Bluetooth, FM"
While the HW / OS Spec doesn't look like the best (512 MB memory, Old Android 4.4.2), I hope they will release a new version soon (More memory and newer OS version), So I wonder how is the quality of the screen under day light and if anyone has any experience with this unit. I followed your link and I have to say my phone is bigger and has more memory for only $60 more. I never bothered finding out what software that was running. Im sorry I but I think it might be a good idea but that is out of date. There's an inmate on here that posted up an unboxing and some initial opinions, but that's all I've seen. Nothing that makes me want to buy one over the Galaxy S5 I currently have. Running a 5 year old OS is kind of silly for an item touting the latest model for 2017.
bobobob, DaMonk45 and ygal like this. Bought one a couple of weeks ago. I will post a complete review by the end of the week, but the very short answer is...don' t buy it yet. Thanks. Will wait to read your review. In addition, after reading the previous remarks , I do believe that instead of spending money, buying this unit - I may buy a "rugged phablet" (Large phone) , but still not clear which has the best "anti glare" screen. 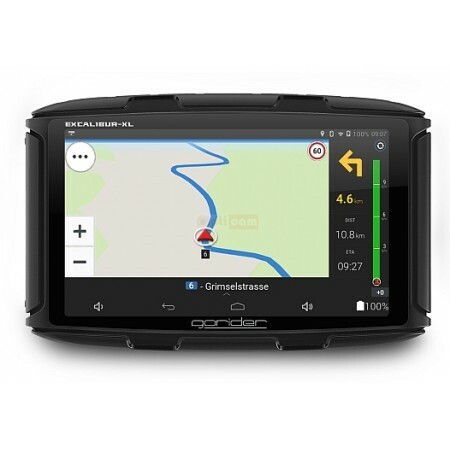 Review of a Prolech MT5001 GPS. This review is largely in comparison to traditional GPSs (proprietary/closed OS, single-purpose hardware), but also compares the MT5001 to other Android routing solutions. It's got a well designed mount--sturdy, with a security screw. None of the routing apps I tried (Locus Pro, Navigator, OSMAND+, iGO, Map.Me, Sygic, Magic Earth) are particularly good for motorcycling for various reasons. The GPS has a nice launcher screen with just 6 large buttons, making them easy to find while wearing gloves (if the touchscreen itself recognizes the finger press at all) ... However, it seems to be locked -- except for the 'Navigation' button, you can't change the application that's launched from each button. The best navigation on the GPS is from iGo -- preloaded by Prolech. It's pretty good software, with an almost-usable on-screen interface. However, the bad side is that Prolech appears to be distributing a cracked copy, with no legitimate avenues for support/software updates/map updates. If Prolech added those improvements, even at a moderately increased price, I'd buy another GPS from them tomorrow and would recommend it highly. As it is, the Prolech MT5001 would be pretty decent in a car (or maybe an Ecomobile or BMW C1, something where the screen is shielded from most of the direct sunlight), but it's not suitable for motorcycle use at all. Anyone want to buy a lightly-used GPS? Comes with 2x car mounts, 3x moto-mounts, and lots of frustration...but it's cheap! As a side note, I played with lots of different Android software on the GPS. 59DEN, ñakice, VmaxChuck and 2 others like this. I used the MT5001 now for about 5.000 km in various conditions. Home-Work with the more than excellent TomTom Go Mobile app and Osmand+ for rideing tracks and allroad routes. The screen is more or less ok. It is 'slightly' below the Zumo 590 and TomTom Rider. I have some images to show you later. Sure, it is not the best, but once you have route-line on the screen it is ease to follow. Certainly using TomTom and Osmand+, because of the excellent directions on screen and voice. Personally, I would like a better screen and yes a better Digitizer. The reason you have the wait after hitting a button is because the system not ready for action. If I wait 20 seconds, everything is fine. That brings us to the fact that the system is slow in starting up, but heck, so is the Rider. I am using the same time as my pals with Riders and Zumo's. The Android KitKat or 5.0 for that metter is a no go on GPS systems. Simply because it is difficult to get maps on the external SD card. Google decided the external SD is a threat and there were no SD slots in the Nexus Phone. For instance I cannot get my TomTom maps saved on the External SD card. Whatever I try. The apps are difficult to use with gloves, yes. But mostly I am for fun on the track and stop and take of the gloves. No rush. I can live with that. The BT and WIFI connections with my Lumia Phone are excellent, no complaints there at all. Auto connecting. 1. I know that for above reasons Prolech is testing at present a Android 6.0 system. They should be ready about now. 2. I asked them to upgrade to at least 1GB RAM to speed up the system. But that is not there yet. I told them it limited the sales. 3. And do optimize the digitizer and a better screen: Transflective OSG? O yes, I took off three (!) screen covers and replaced it with an anti glare one. It protects the screen, but I think I will take it off. VmaxChuck and ygal like this. You might want to do some more research. 4.4 which is the OS that your unit is running IS Kit Kat. As for Lolli Pop, it wasn't all that difficult to deal with the SD cards. It surely wasn't a no go as you claim. I actually used it for a while on my S5 so I kinda know that it does work. I had my Locus, OSMand, and Here maps on the SD card. Marshmallow makes things way simpler. The OS looks at the SD card as just an extension of the internal memory when you configure it correctly. Are you saying that the MT5001 has 3 layers of screen protectors? How do you keep it sealed against water entry without the screen protector? The first layer you peel off if you un-pack it. But I still saw the real protector and found the screen somewhat blurry. So I wanted to change it with another one. To my surprise there were two screenprotectors. I removed them and placed a new one. Screen protectors have no relation to water-proof Y/N. They protect the screen against scratching. And some take the sunlight glare away. Installed an app (Lux Lite) to ensure that the screen intensity is at full brightness when the GPS is connected to power. The effect of these 3 changes is that objects (buttons, menus, icons, map symbols, etc) are much more readable and easier to hit accurately while riding, the digitizer recognizes the keypress events better, and the screen is (very) slightly brighter...making the GPS overall much more useful! KiLeR650, zuni and Tripped1 like this. Excellent! I am going to try this. My son has mine with him, but will be back in the weekend. Maybe a small tutorial/how-to? Thanks in advance! This app was reason to root the device, but unfortunately, it did not help. Tomtom still see only internal memory. Maybe with root it will be possible to change the assignment of the main screen buttons. I had no time to look for it. I have bought a mt5001 this week and I'm waiting for it. I see comments from @gts1000^2 and I think are very interesting. My first idea was install TT go and see it seems the best. Anybody has tried to change home menu with others, like big menu app? Seems no need change gps info or something to use TT, no need Apps like device faker or phoneid changers, isn't it? TomTom only works on the internal SD card. So you have to move iGO and its map to the ext-SD card. But the easiest way now is to move the iGO app and Maps to your SD card. That leaves enough space on the internal disk (called SDcard) to install maps. I did this with TomTom Go Mobile. Attached the description how to move iGO. Please use the iGO_NF app in the zip file, the old iGO_nf apk is not ok. Follow the instructions step by step and it will work. Anybody has tried to change home menu with others, like big menu app? I don't know what specific app you mean by "big menu". Can you give a link? I did try to change the default launcher app (which is what I think you mean by 'home menu') to Car Home Ultra, both by using the Car Home Ultra Patch and through various Android debug commands to disabled the default launcher and use CHU instead. None of the attempts were completely successful, and some required use of the debugger and/or reflashing the firmware(!) to recover. I'm 100% sure if I rooted the GPS that I could change the launcher, but I haven't tried yet. No, none of that is required. Anything that will work on an Android 4.4.2 (KitKat) device with an 854x480 (or, probably 800x400) screen should be OK.